In four independent school studies in Colorado and Illinois, the composite scores of 576 students prove the effectiveness of the ZAPS® test-prep seminars. The graph above shows the impact of the ZAPS ACT Test Prep seminar on ACT scores at four high schools in Colorado and Illinois. Of the students in the study, 84.2% realized an increase in their composite score. In fact, 46.8% of all students increased their composite score by 3 or more points. 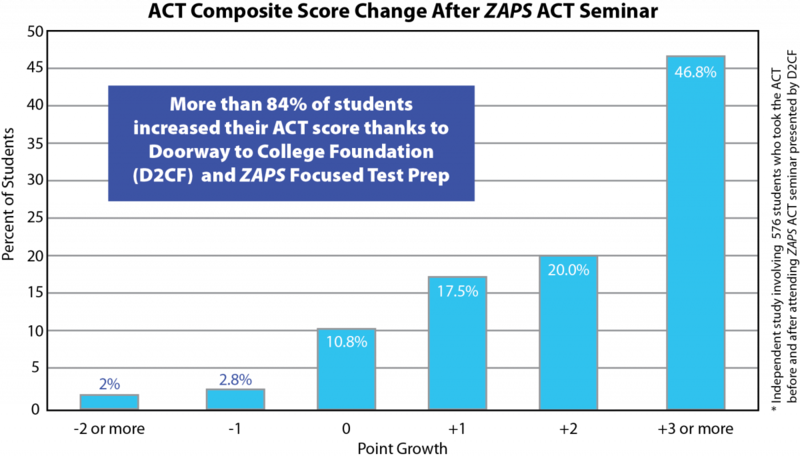 The results of this study demonstrate the highly effective, positive impact of ZAPS ACT prep courses to improve scores. The study included 576 students who took the ACT for the first time in October 2011. These students participated in a five-hour seminar, and each received a ZAPPING the ACT Study Guide and ZAPPING the ACT Workout materials for ACT subtests in English, math, reading, and science. The students took the ACT again in April 2012 after this seminar. According to an ACT College Readiness Study – which measured the results of programs like ZAPS – there is a statistical score difference between students who take an effective test preparation program and those who do not. Students who take a ZAPS ACT strategy seminar or webinar typically raise their ACT score by 2 to 4+ points, and often higher (max score: 36). Those who have taken a PSAT/SAT strategy seminar or webinar (prior to the 2015-16 test redesign) usually see increases of at least 5 to 15 points or more (max score: 80) on the PSAT and 50 to 150 points or more (max score: 2400) on the SAT. If your school or district is interested in conducting a case study on ZAPS test prep for improving ACT or SAT test scores, contact the Doorway to College Foundation research department for assistance at research@doorwaytocollege.com.